Nonprofit events are an integral part of fundraising, but hosting one tends to involve high overhead. In order to show a positive return on investment of the time and money it takes to throw an event, nonprofit teams also need to figure out how to increase event attendance year over year, which is no small feat. Using discount codes to increase ticket sales can help alleviate some of that stress. According to Market Track, 83 percent of U.S. shoppers have made an unplanned purchase based on a promotion or coupon. Every day there is a new offer in your inbox or promotional pop up in your newsfeed urging you to “take action now” before the deal ends. People are heavily influenced by discounts and the premise of a limited-time offer, so you should definitely be using this tactic for your nonprofit event marketing. Whether you’re hosting a spring charity run or a silent auction, your organization can use discount codes to get supporters involved in its special events. Here are four best practices for using promotion codes to increase event attendance. A sense of urgency can really push people to act, especially when it comes to sales and promotions. Consider setting a specific date to your promo code to make it a truly limited-time offer. You can offer an early bird discount to drive early event registration, or run a promotion within a specific timeframe leading up to the event. Make sure to blast these terms in your event promotional messages to get supporters keyed up. For instance, if you use the Classy platform, you can set a start and end date for using a discount code to up the urgency of your ask. These announcements can help drive traffic to your registration page and build excitement around your event. And since you can add an unlimited amount of promo codes on Classy Manager, you can experiment with different promotion strategies for different events to see which your audience responds to best. When considering how to increase event attendance, don’t forget how important audience segmentation is in marketing and fundraising. The same idea applies to discount codes. By creating different codes for specific target audiences you can improve engagement with potential registrants. This will help increase buzz around your event within particular groups and communities. For example, if you’re hosting a charity run near a college campus, you’ll probably want to target college students and, maybe even more specifically, a subgroup would be to target fraternities and sororities. A creative discount code for this group could be “GREEKRUN”. This code is easy to remember and shareable and also gives the registrant a stronger connection to the event because it feels tailored to their life. If you feel stuck about whom to reach out to, start with your organization’s existing target audiences. Create a custom code for each group and deliver it through a targeted email campaign. People love to share special deals, so exclusive offers can help expand your reach within these micro-communities. An additional group you might consider targeting is event sponsors. 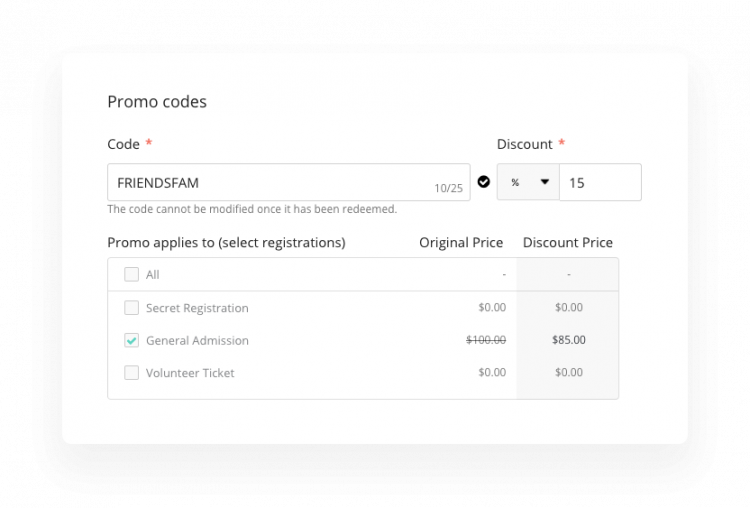 Creating a discount code just for sponsors and their networks can be an awesome way to show your appreciation for their help and support. Again, because the codes are customized, you can track the number of people each outlet is sending your way. After supporters have participated in a fundraising campaign or event, it’s critical to provide them with other opportunities to remain involved. 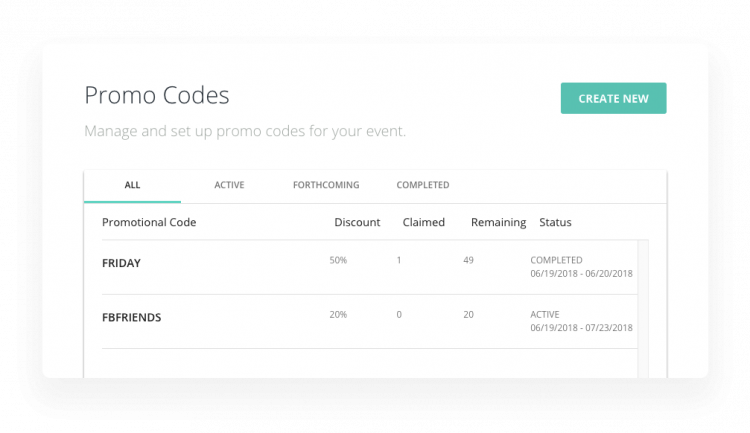 If you’ve just hosted an event and have a future one in the pipeline, you can offer a discount code to your attendees as an incentive to get registered for your next event. For example, if people participate in your bike-a-thon, offer them a discount on-site, or shortly afterwards, to your next event. Getting people re-registered for the next event when excitement is high is a valuable opportunity to deepen their engagement with your cause. By offering current registrants a discount, not only are you encouraging another interaction with your organization, but you’re also demonstrating that you value them as an integral part of your year-round fundraising community. As you determine how to increase event attendance, remember the importance of word-of-mouth marketing. When it comes to saving money, tech-savvy supporters are all about sharing digital discounts. According to a recent study, 91 percent of Americans would share an exclusive deal with family and friends and 43 percent say their sharing is done through social media. But which social network deserves your focus when it comes to rallying event attendees? Adding discount codes in Classy Manager allows you track the performance of specific discount codes. Use a different discount code for each social media channel to differentiate the results on each social media platform. Take the above example. An organization created the code “FBFRIENDS” for registrants who discovered the event through Facebook. The above screenshot shows the code has been used 0/20 times, thus far, and can track the code’s performance in relation to other discount offerings until the code expires or the offer is sold out. Tracking performance of various channels can enable organizations to make informed decisions about what social media channels to focus recruitment efforts. Creating discount codes for your nonprofit ticketed events provides a simple avenue to increase event attendance. Not only are promo codes a great way to get supporters involved, but if shared strategically with targeted groups, they can also provide insight into how to best reach and engage attendees. And, best of all, offering discounts to your supporters will help reinforce that you value and appreciate their lasting support. For more tips on how to host a successful nonprofit event, check out the guide below, Anatomy of a Successful Registration with Fundraising Campaign.